Quick Definition: Circular flow of income is the economic theory that in an economy total expenditure and total income are equal. 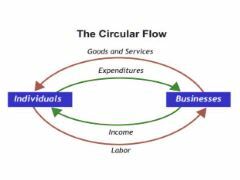 What is the circular flow of income? 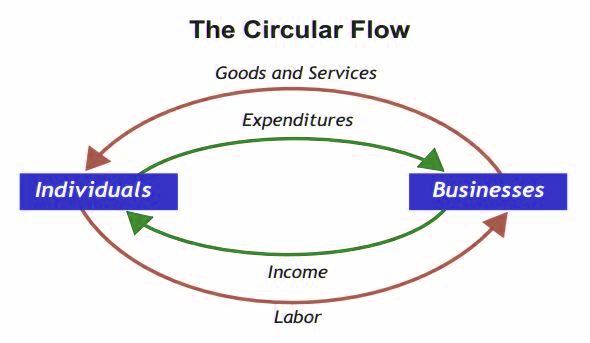 The circular flow of income is a theory that describes the movement of expenditure and income throughout the economy. The households then spend money on the goods and services produced by firms. This money is then used by firms to pay the households for their work, through wages. (This is represented by the green, outer loop in the diagram below.) This process repeats itself and forms the circular flow of income. However, not all income generated will be spent on domestically produced goods. Some of the income is saved, used to pay taxes or spent on imported goods and services. Therefore saving, taxation and imports are leakages in the circular flow of income. Likewise, sometimes there is extra spending in the economy,from investment, government expenditure and spending on exports, which will be added to the circular flow of income. These are called injections. Consumer expenditure – The amount of money that is spent by households to purchase goods or services in an economy. Factors of production – These are inputs used to create goods and services. The four factors are land, labour, capital and human enterprise. Injections – Injections increase the demand for domestically produced goods and services. Injections come from investment, government spending and export sales. Leakages – This is when demand for domestically produced goods and services is reduced due to money being diverted into savings, taxes or imports.